THE KITCHEN – This project practically took over our entire 2018 and I’m happy to report it’s 100% of the way finished! You can get more details in our kitchen reveal and kitchen remodel FAQs posts. 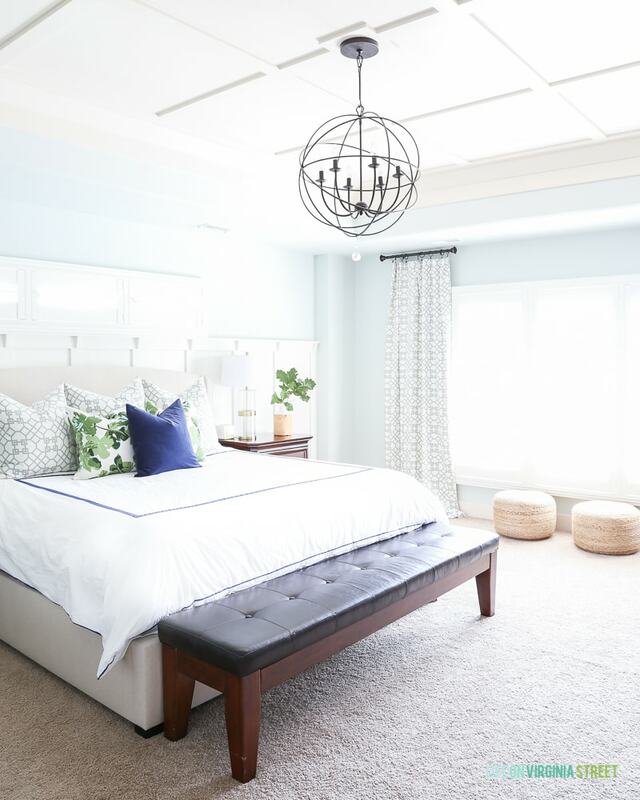 MASTER BEDROOM – I don’t know why I continue to fail on this one! But, I promise you this one is in the works, as I refuse to let another year go by without an update here. In fact, I already ordered new nightstands and I can’t wait to show them to you once they arrive! RENTAL PROPERTIES – We added one more to our portfolio as we had hoped. And it’s turned out to be our biggest headache yet! As I mentioned yesterday though, there’s finally a light at the end of the tunnel. 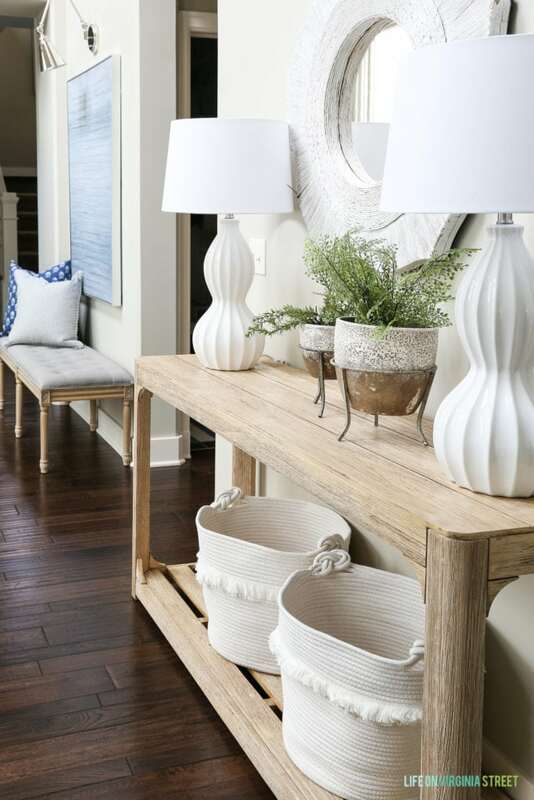 FINISH THE LIVING ROOM – This one is also finished! I was able to wrap some of this into our kitchen renovation. 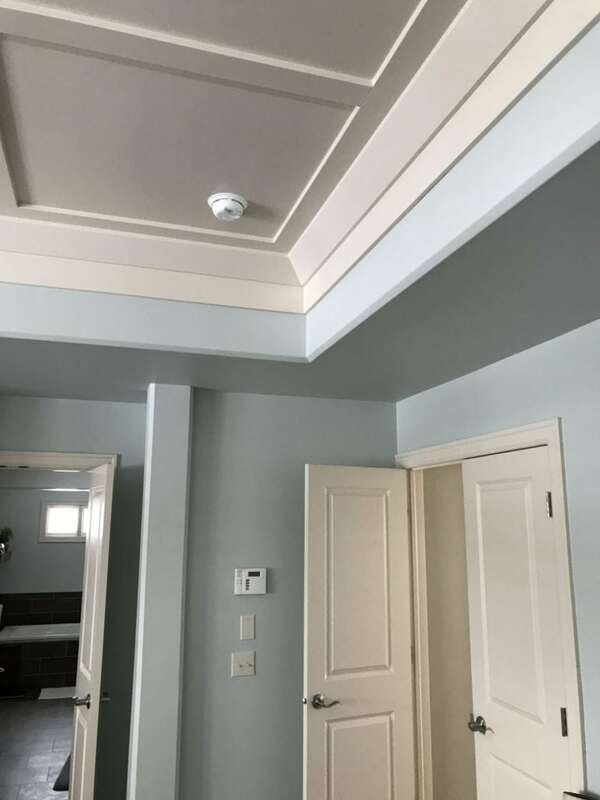 I had done the first coat of paint on the ceiling but knew once we finished the kitchen that area would have to be painted again, so I let the pros handle it. We also snuck in a fireplace makeover while we had carpenters here and I love how it turned out! PAINT THE EXTERIOR – Whew! This one made it too! I actually didn’t think this one would happen, but when I had a painter over to look at our fence, I had him also bid the exterior just so I knew what we were looking at “down the road”. Turns out our ten-year old paint, caulking and siding were in major need of an update. So, what was a dream became a reality. You can see the full reveal here. And now for the 2019 goal list! We have another major renovation planned in 2020 or 2021 and we’ve been saving for it basically since the kitchen was completed. So, this year’s updates are mostly cosmetic. 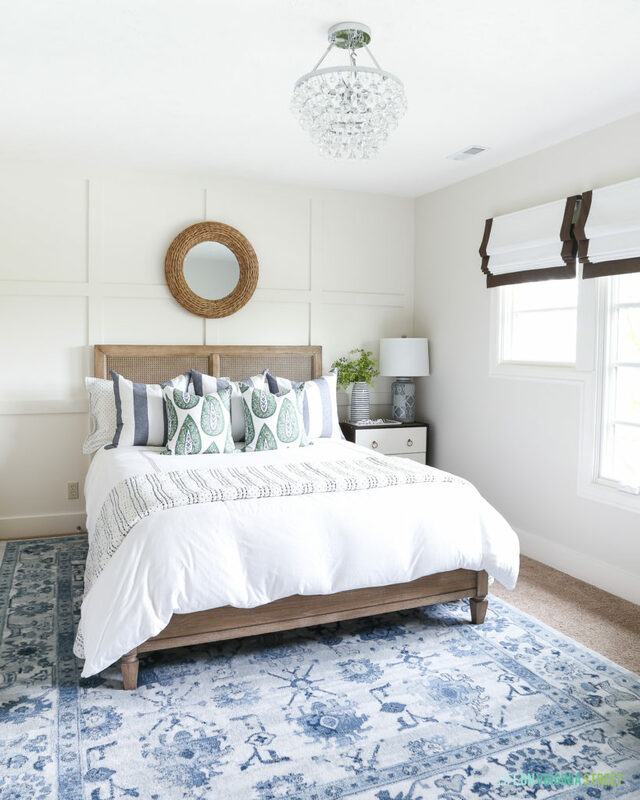 MASTER BEDROOM – As I said, this one is non-negotiable! 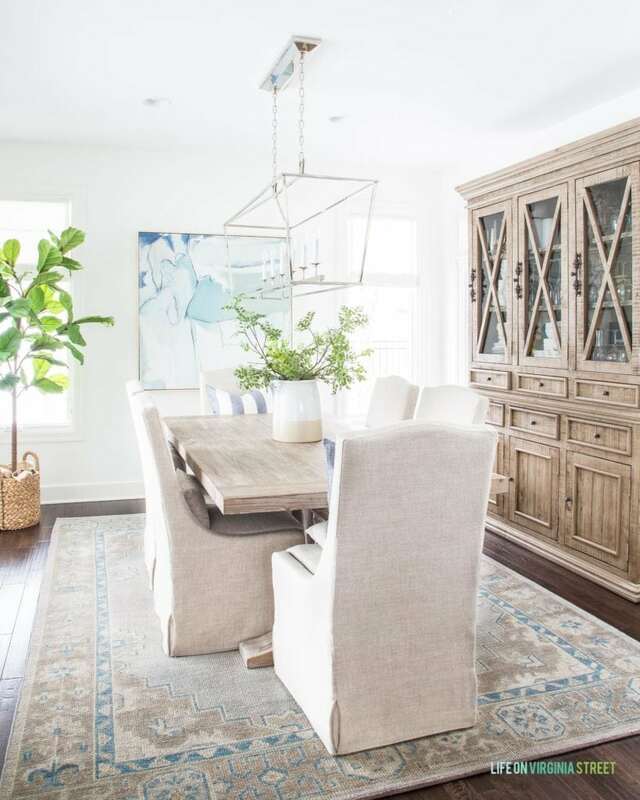 We have to get rid of the blue walls, almond colored ceiling and our dark furniture. I plan to keep the bed the same because we love it so much and it still feels current and fresh, even at eight years old! Here’s the last full room shot I have of our bedroom. The contrast between the blue and almond colors isn’t nearly as bad on super bright and sunny days. But here’s a view in a darker corner on a darker day. See how it all looks baby blue and pink/yellow? Thankfully, once I pick paint colors, this is something I should be able to tackle. I’m not looking forward to painting the ceiling, but, because it’s in grids, that actually makes it a lot easier! THE CRAFT ROOM – Kurtis and I talked a lot about this space over the holiday break (ad nauseam if you were to ask him). We ultimately decided this room was never going to work as we currently have it. And sadly this is the second time we’ve come to this conclusion. We added the extra storage so I could store all my fabric, pillows, decor, etc. And it worked for awhile. But the reality is, the cupboard space wasn’t quite deep enough and things ended up on the floor. Then I added a little studio to shoot my outfit flatlays in the space, and it all got a bit chaotic. The daybed has been used a handful of times and as cute as it is, it really closes off the space – and we’ve come to realize we are both way too tall for a twin bed – even if it’s just for movie watching. We talked, and talked, and talked some more and ultimately decided we want to turn this space into more of a den. There is no reason it needs to continue being my dumping grounds. So, we worked tirelessly in the basement to get it to a point where I feel comfortable storing stuff down there. I’ll be sharing my full plans for this space soon, but I’m excited to get it back to a place that will actually be used for something more than a storage closet. It became abundantly clear in the fall and during the holidays (hello, Hallmark channel) that we need more than one TV in our house. You may remember we moved the one from this space down to the main living area since our other one quit. We’ll have to get a new smart TV (since we only had the one) and there are no cable outlets in this room. Thankfully TV’s are so much more affordable nowadays! We’ll also likely be relocating the IKEA cabinet to the basement. 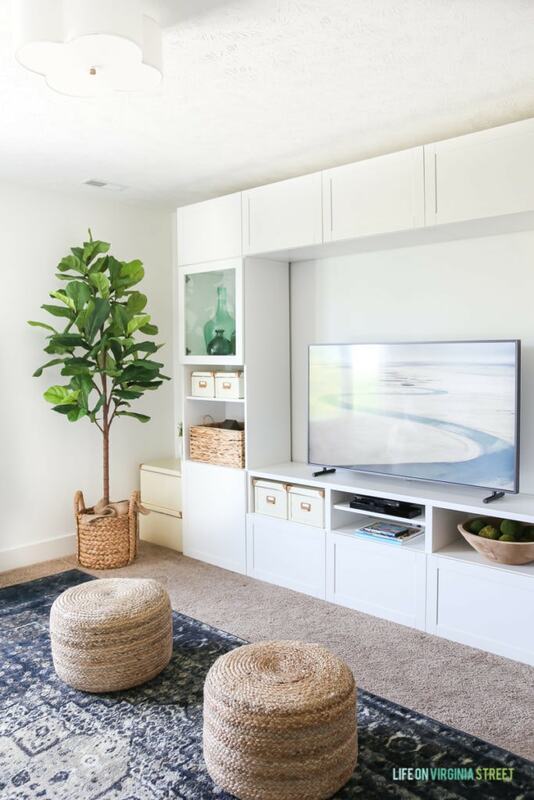 We will probably go with a simple TV stand and a sectional that can be tucked into one of the corners to maximize the space and also make it feel much cozier in here. I also have some fun wall treatment ideas if I can get Kurtis on board. THE SMALL GUEST BEDROOM – As you know, I worked pretty hard on this space last year and I’m happy with the progress. I’d say it’s about 85% of the way done. I have a few updates I’ll be sharing next week that will get me to 90% of the way there. I still need to find a real night stand one of these days (we’re still using this DIY version). 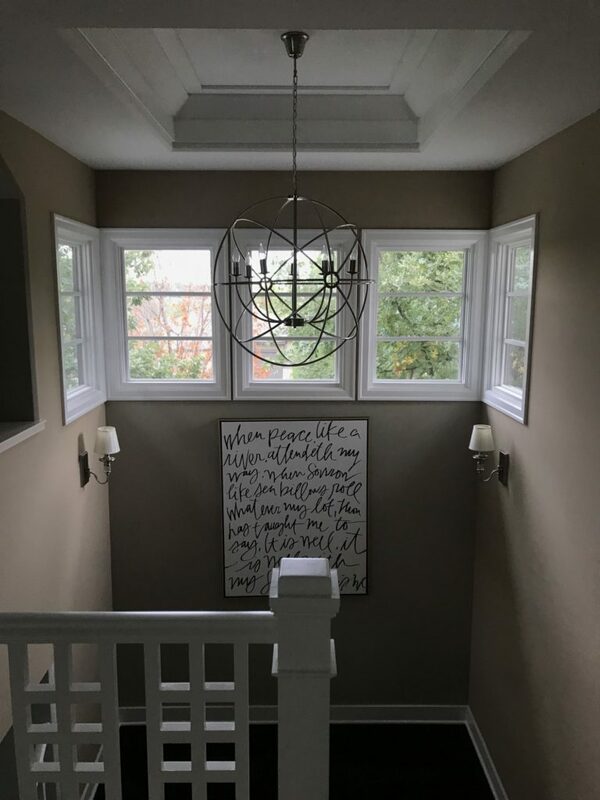 I’ve also thought about going darker with the board and batten (and possibly lightening up the wall in the office – basically flipping them). But those are just minor – and probably unlikely – changes. Stay tuned for a few more fun updates next week! THE BATHROOMS – Another one that always makes the list. I talked more extensively about it above. 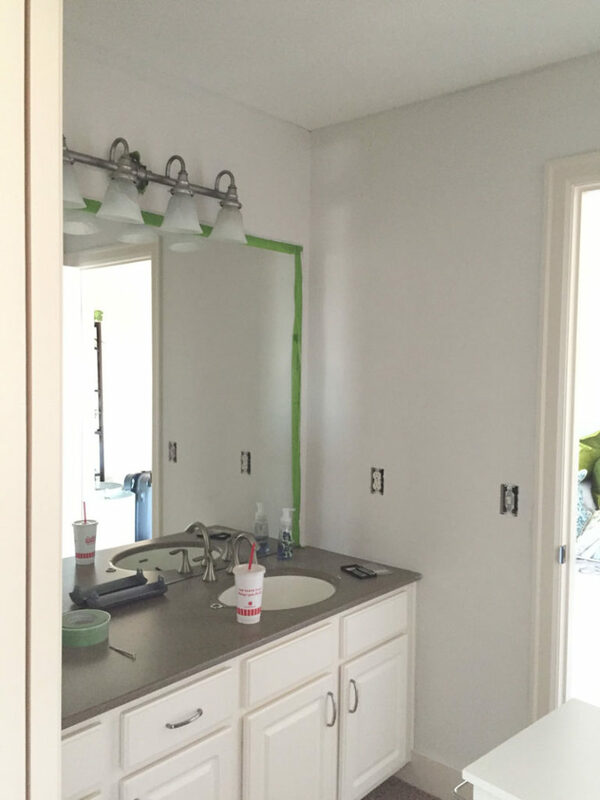 I don’t see our master bathroom getting updated for several more years (or longer), but I’d love to do the jack and jill just to give us a sense of how much work is involved. We’d have to hire out the tile (I have zero interest in trying to tile a floor on my own) but the other updates are likely something we could handle. It gets pretty heavy use in the summer months and whenever someone is staying with us, so it would be nice if it fit in a little better with the rest of our house! The vanity area is currently all carpet. And it’s buckling carpet at that. We’d love to have a double sink rather than one lopsided one, and we’d like a little taller cabinets (that aren’t plastic). The Corian countertops are also very bleached out around the faucet. And yes – the duck tape is still there from at least two or three years ago. This area has tile but it’s very dark brown 12×12 tile. I’d love it all to flow from one area to the next. DINING ROOM – I won’t go into too much detail here since I did in this post but I plan to make some decisions here over the next few months. It’s so close to being exactly where I want it, so this one seems pretty achievable! But, I’ve been watching religiously to see if the cane chairs I wanted would go on sale. And it turns out, they’re no longer available! Womp, womp. I know some of you said the cane probably wasn’t a great mix if they happen to get wet with pool clothes, so now I’ll be searching for a new more durable option! THE STAIRCASE – This has been on my list multiple times as well. We had initially planned to tackle this project over Christmas break but the math scares me a bit and Kurtis ended up getting sick. So, we’ll see what happens. The plan is to do board and batten on all three walls. At minimum I have to get it painted this year! One wall is Behr Castle Path and the other two are the original matte paint that is in bad shape! 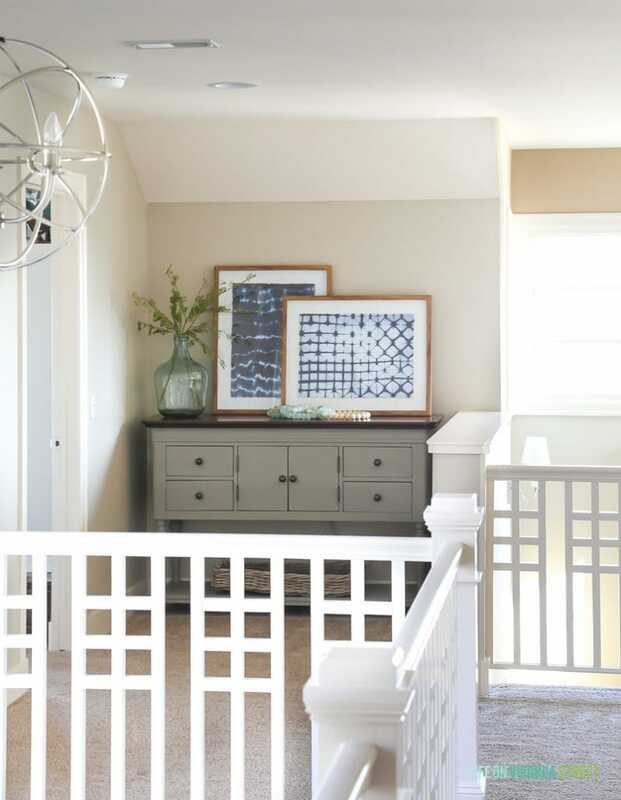 The hardest part with this project is I need Kurtis here – even if it’s just to paint – because of the ladder situation. 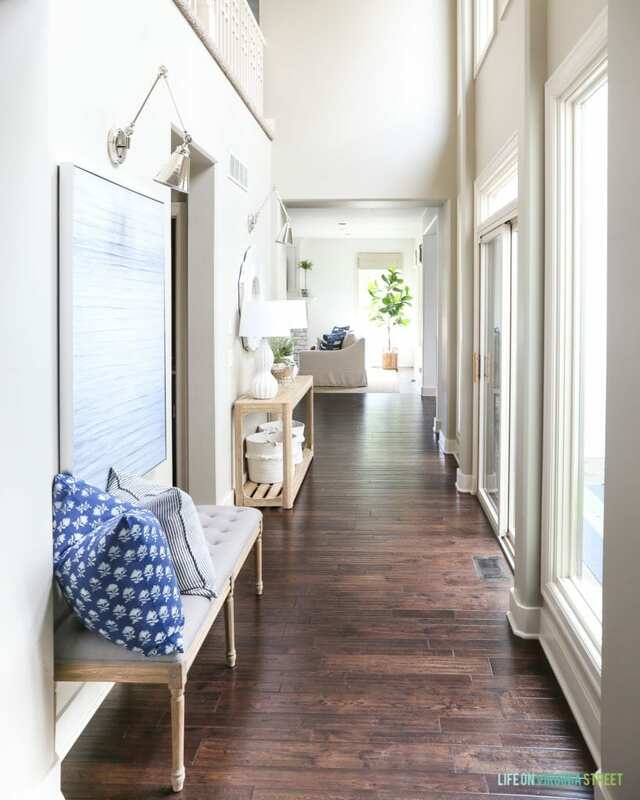 THE ENTRYWAY HALLWAY – This should be a fairly easy one to crank out. The bench has actually had a busted leg since the day we bought it, but now two legs are broken and some of the edges are fraying badly. The cats love to stretch on it and mess with the piping. So it needs replaced at some point. I haven’t decided if I want another bench there or if something else would make more sense there (even nothing)? I’m still loving the HomeGoods art find so that will likely stay! I’d also love to replace the mirror on the other end. It was another HomeGoods find from the year we moved in. Henley continues to rub on it and one corner is peeling off. Are we sensing a theme here? I say that, but then have to admit when I was putting Christmas decorations up in November, I bumped the mud room art into the lamp on the end, knocking it off and shattering it. Maybe it’s a sign I shouldn’t have so much crap in this area! WI-FI STATION UPDATE – You may have forgotten about this area because I rarely show it. This is where all of our wi-fi, router, modem, etc. are stored. It’s in the upstairs at the top of the staircase, just outside our smaller guest bedroom. It’s the first thing you see when you walk out of our bedroom and I’m really not happy with how it looks. This one is definitely not a priority but I’d love to give it a little refresh at some point. We’re using our old buffet/TV stand from our last house that I chalk painted shortly after we moved in and we don’t need anything nearly as large for this purpose. So everything just feels off to me. I may just re-purpose something we move from another area! MANAGE THE CLUTTER – I feel like I’ve actually done very well on this one the past few months. But I need to carry it all throughout 2019. In the past I’ve been so bad about keeping things just because I’ve had a spot to store it. But the reality is, all the clutter drives me nuts. I’m going to purging and really decided what we need around here. The rest will be donated or sold! 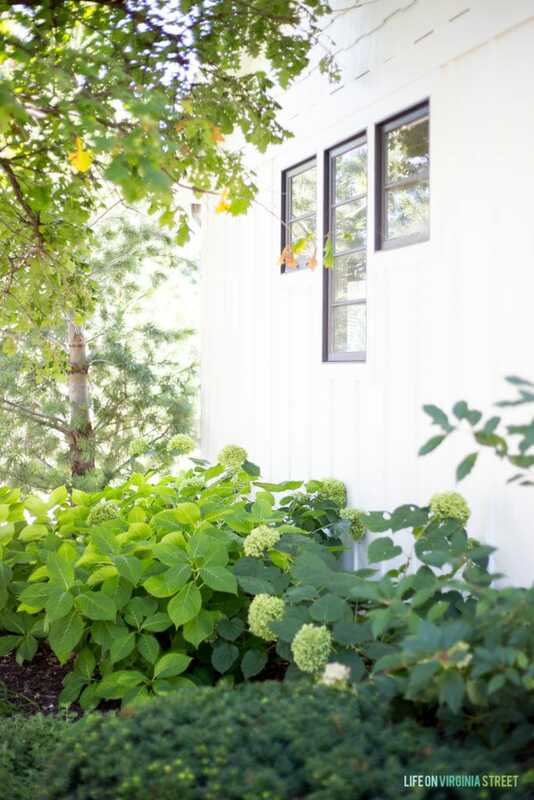 ADD MORE HYDRANGEAS – I actually don’t know why I’ve never thought to add this to my list. Especially since I would have achieved it every year! Over the six years we’ve lived here, I’ve slowly been adding a hydrangea bush or three each year. And the more I add the more I love them. They bring me such joy each year when they are blooming. Now that we have plenty out front, I’d love to get more in our backyard, where we spend so much of our time! We have several areas along our back fence line that would look perfect with some color and texture, so I’m hoping to get more planted in the fall! RENTAL PROPERTIES – One of our goals this year is to get a property manager. Yes, it hurts the bottom line a little, but we’ve ultimately decided that the management side of things is taking up way more time that we expected. Especially since we’ll have four properties occupied in the next few months. The maintenance calls always come at the least opportune times, and we both have enough going on at any given time that we’d love to turn this over to a professional. Until we actually do this, I don’t think our rental company will be able to buy any more properties – since we’re pretty much tapped out from a time perspective! Fingers crossed! So, there you have it! The list looks lengthy but I think it’s rather achievable even with a few other unplanned updates that pop up along the way. It sounds like a lot. But, given that none of these goals require major renovation – and more just elbow grease on my part – I think they can be achieved! Knowing that I don’t enjoy working on projects nearly as much in the summer, I’m hoping to crank a few of these out here shortly before the weather gets nicer! I’ll be sharing more design boards soon! Am I the only person who hates double sinks? 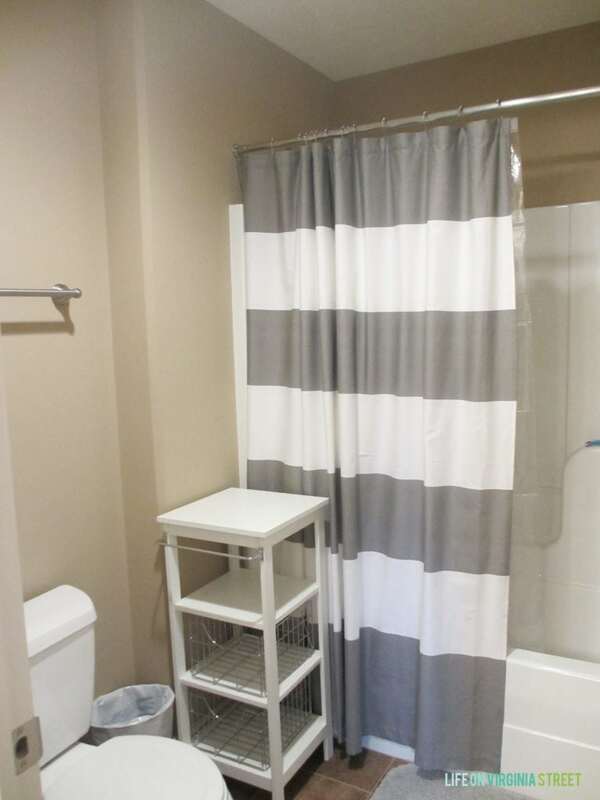 I’d much rather have a large expansive counter space, especially if I was in a guest bath. I travel with a medium-sized toiletry bag that never fits opened nicely on the counter if there are two sinks. Not to mention, when I’m a guest in someone’s home, none of us are ever using the sinks at the same time. (In fact, at home I can count on one hand the times my husband and I have brushed our teeth at the exact same time using our double sinks ). But a double full-length mirror, or extra large double shower, I’m ALL in for that! I’m probably a weirdo. I’m sure whatever you do will look great! I wish I lived closer so that I can stalk your area’s Facebook Buy Sell Trade page. Ha! That daybed is divine!! I always love your home posts as you always have cool things in the works. I need your help with something. I just bought a faux fig tree, 5’ tall and, once I find a pot I like, what’s your suggestion for putting weight in the pot (around the tree) to anchor it and hold it upright. Thanks for all the hard work you put in around your house! Hey there! 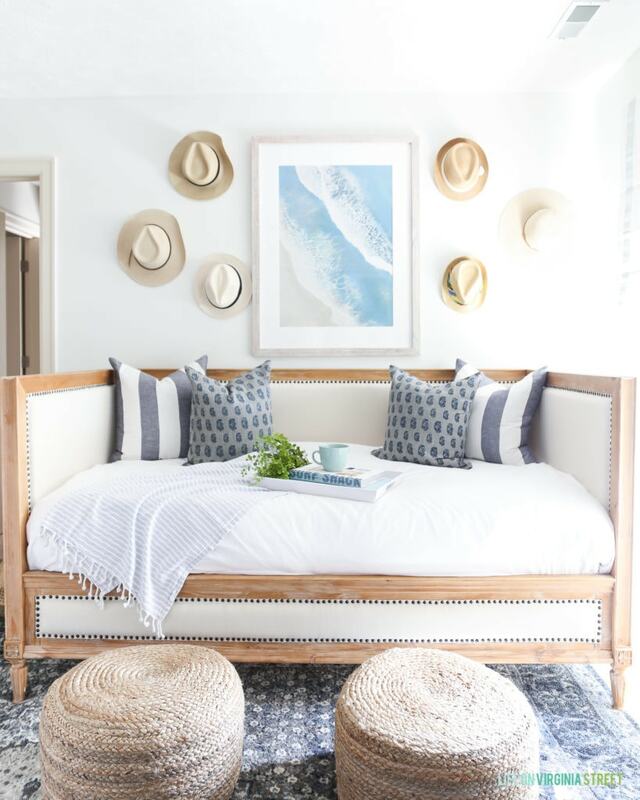 Love the daybed! Went to link and it says it is 82″ long—doesn’t look that long in the photo, though. Could you confirm? 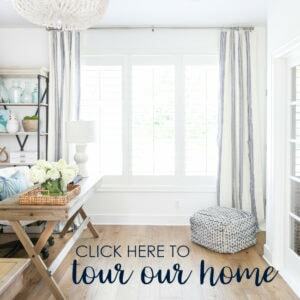 You have a lovely home–enjoy your posts!! 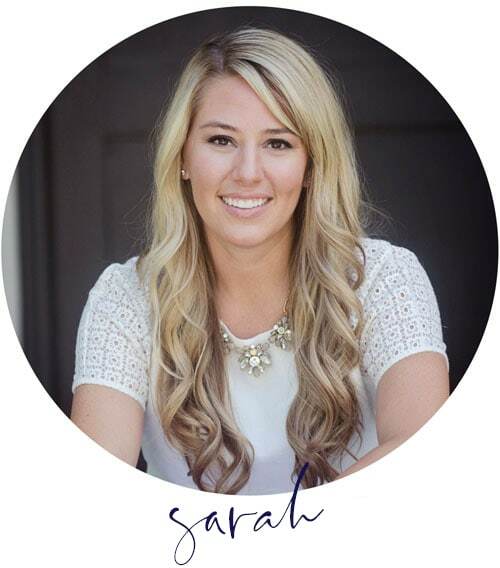 It’s a new year Sarah! I’m always excited to follow you. Hi, where did you get the art on the stairs?